While I admit to suffering a blister from cheap flip flops, I am happy to say I met my other goals, plus got a whole lot more in the bargain. I’m not quite sure how it happened, but I ended up friends with this anonymous dude who writes Filets to Fishsticks. I think it was because I told Him he should go get some acunpuncture. Anyway, I read His blog, He reads my blog. We each tried to write a novel last November, He finished, I didn’t. The thing I like most, besides His sassy tweets, is His blog has such a clearly defined voice. And you know this is a guy who loves His family, knows His flaws and is comfortable mocking Himself. And really, that’s the biggest thing I look for in a blog. His style does bear a bit of explanation. To protect his anonymity, He refers to Himself and His family with the first letter of the relevant pronoun capitalized. It’s not a Jesus complex or anything. I don’t think. We’re public schoolies, sort of. I’m a tried and true public kid, k-12. She’s Christian elementary turned Montessori 6-12. I came out of it okay overall with the exception of a few small scars, but She didn’t fare as well. Looking back, in fact, She’s fairly irritated with Her educational background. Regardless, due partially to money and partially to personal belief, He’s a public kid. Yes, We threw our now 7 year old son to the educational wolves 2 years ago and We haven’t looked back. Okay, that’s not entirely true. Despite the fact that many chose to let the public education system guide the ins and outs of their child’s school life, We don’t. Not yet, at least. His run through kindergarden was nightmarish at best, thanks to a truly uninvolved and uninterested teacher, and We decided that We couldn’t have that happen again. So We wrote a letter. I know, We’re daring and edgy like that. But it worked. He got a great teacher and everything was fantastic. The She and I hit the great divide. Having had one good, solid year, I was inclined to let it be, thinking He’d fare well with His newfound interest. 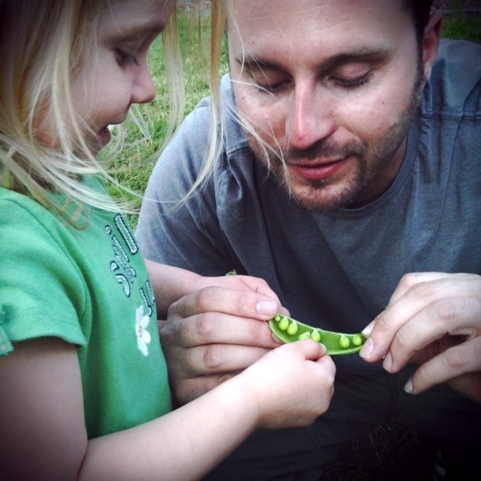 She disagreed, then panicked, then e-mailed His first grade teach. Then set up a meeting with the new principle and tried to have Me be the only attendee. Which, you know, wasn’t cool since We weren’t on the same page. So We did the face to face thing a few days ago. We meaning She came as well. Will it matter? I’m not sure. The new principle fed Us the same “every teacher should be able to teach every child” line We’ve heard before, but something about her recital of it didn’t seem whole hearted. So maybe there’s hope. Either way, We’ll continue to speak up (or argue about speaking up) and We’ll continue to fight for His education. Why? Because We believe in Him and his right to not have a miserable time when His main focus should be math and reading. And Cray-Pas. Because Cray-Pas solidify nearly every public-school memory in existence. Now, go visit His real blog and follow Him on Twitter, you’ll be thanking me later. It’s hard to describe the feeling of delight I get when someone new starts commenting on my blog. I remember wondering who this new Kristin was the day she left her first comment here at Mommy’s Pen. 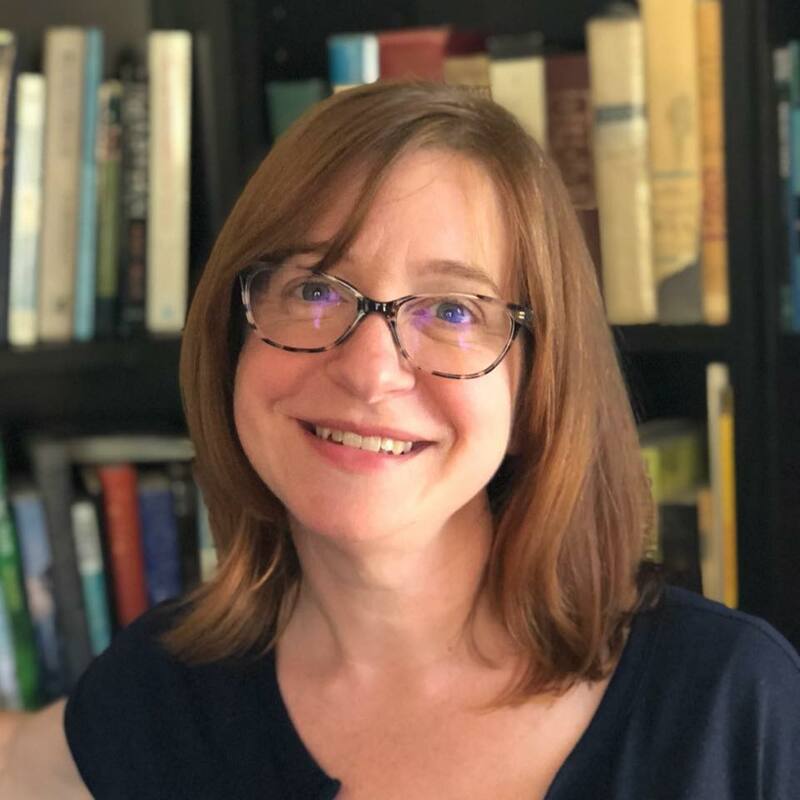 (My reader base is comprised almost entirely of people named “Kristin.”) Even more delightful, when I traced her back to Twitter and her blog, I found her sharp, funny and engaging. But this post was what did it for me. It’s exactly the type of thing I attempt to do here. Among the first posts I ever read at Mommy’s Pen was this one about Sue’s acquisition of Fezzik the Giant Chicken. And I knew instantly that I loved her. After all, any fan of The Princess Bride is a friend of mine. OK, I admit that last one is a little harder to slip in under the pretense of everyday conversation… but it can be done. 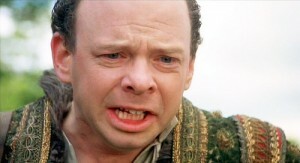 The Princess Bride quote I most often use, however, has to be, “INCONCEIVABLE!” infamously (and continually) uttered by the villainous Vizzini, played by Wallace Shawn. 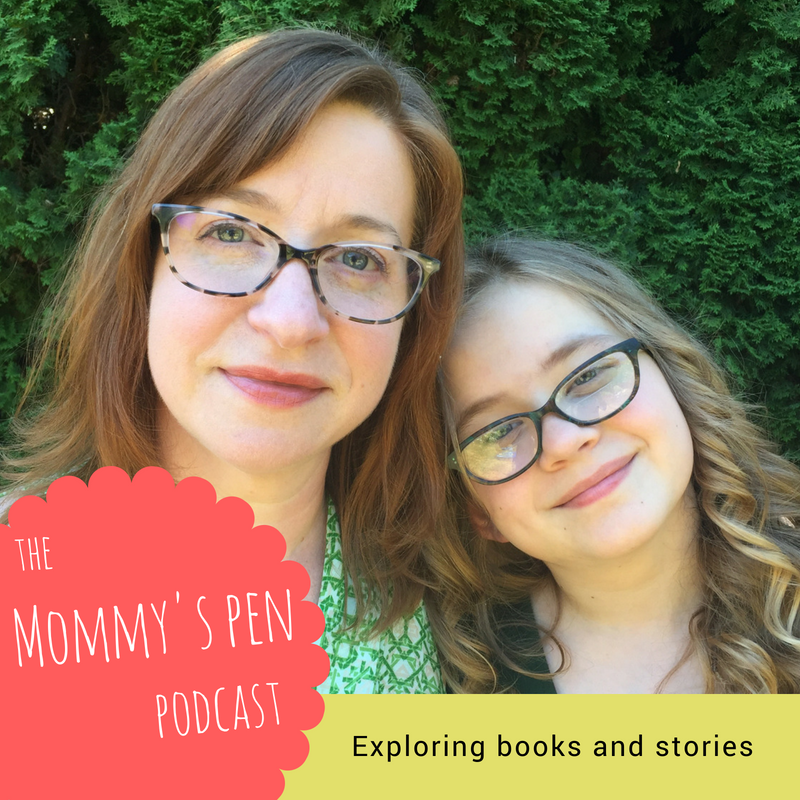 Now, here it should be noted that another reason I enjoy reading Mommy’s Pen is for Sue’s occasional series, Ben Stories, about her husband, Ben. Because Ben sounds like a pretty fun guy. At least, that’s the assumption I have to make about someone who idolizes The Dude from The Big Lewbowski enough to want his very own Dude sweater. So today, in homage of Sue and her kind invitation to hold down the fort at Mommy’s Pen while she’s off living it up in San Diego at BlogHer, I’ve decided to share a story about my own husband, Jim. A Jim Story, if you will. Jim – or Hubs, as he’s known on my blog – loves that I love to quote Wallace Shawn from The Princess Bride. Because Wallace Shawn is what he likes to call a B-celebrity. And Jim has this quirky fascination with B-celebrities. ‘Quirky’ is a relatively new term on my part for this particular interest. I used to find it just plain weird. But just as some endearing habits become annoying over time in marriage, so too do annoying habits become endearing. Of course, my patience only goes so far. So, when he and his buddy, Doug – who shares this strange fascination – start trying to one-up each other with names of various B-celebrities, each one more obscure than the last, I generally roll my eyes heavenward and move on to something more fun – like sticking bamboo shoots underneath my fingernails, for example. Hub’s affection for B-celebrities stems from sheer non-conformity. A self-proclaimed movie buff, he says the bit characters in his favorite films are often funnier or more interesting than the main characters. And since the actors who play them tend to make the rounds, he always gets a kick out of seeing them pop up in movies and on television shows in various and often dissimilar roles from ones they’ve played in the past. Some of his favorite B-celebrities over the years have been Sorrell Booke (otherwise known as Boss Hogg), Conrad Bain (America’s favorite 80’s dad on Diff’rent Strokes), and Wayne Night (or, “New-man,” as Jerry Seinfeld would say.) 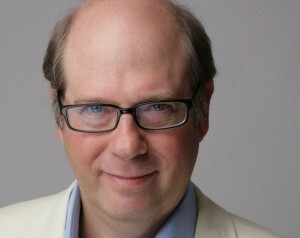 But none surpass his most favorite B-celebrity of them all – Stephen Tobolowsky. Stephen Tobolowsky has appeared in over 200 titles (205 to be exact), and has played everything from a profanity-spewing head trauma patient in Memento to a bumbling tourist in the now-defunct TV show Las Vegas. But Hubs loves him best as the uber-annoying Needle-Nose Ned Ryerson in Groundhog Day, in which he repeatedly torments Bill Murray’s character, Phil Connors, as a former high school classmate turned insurance salesman from hell. Last summer, I got into Glee during its Season 1 reruns. That’s right – I’m a Gleek. And in the pilot episode, who should happen to show up playing the creepily flamboyant fired Glee club coach Sandy Ryerson, but Stephen Tobolowsky! 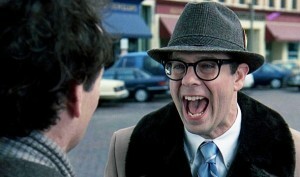 “Jim!” I called excitedly, “Stephen Tobolowsky is on Glee! And his character’s last name is Ryerson!! !” I bet they did that on purpose, those crafty Glee writers. Hubs entered the room, glanced from the TV to my eager face, and began to laugh. “Oh, I can’t wait to tell Doug about this,” he chuckled. What’s your favorite Princess Bride, Groundhog Day, or general movie quote? Nora stumbled into the living room, dragging my wheeled carry-on bag behind her. “I’m going to California. Would you like to come with me?” she asked in her grown-up voice. She lead me through the dining room and kitchen. When we stepped into the hallway, she said, “We’re getting on the plane now, watch out for the big space between.” She meant the gap where the jetway meets the plane. At the end of the hall we climbed into bed, or rather, or seats, but she wouldn’t let me lay down. I switched on the window unit air conditioner, to emulate the sound of take off. After a few minutes, we landed, and she led me to our rental house, on the front porch. I’m thinking this little game means her tiny psyche is processing my upcoming trip. 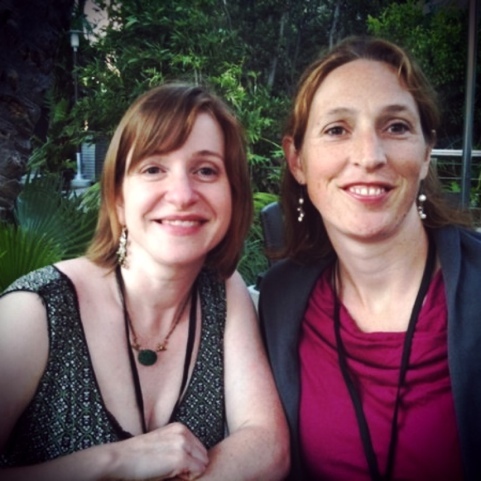 I’m leaving for San Diego on Thursday evening for Blogher’s annual conference. It will be my first weekend away from Nora. Gulp. Outwardly, I’m trying not to make a big deal of it. Inwardly, I’m excited for the conference and scared to be away. Ben has been instructed not to tell me if she’s a mess. Obviously, we’ll both be fine in the end. 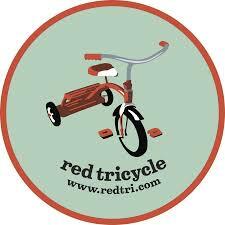 Starting Thursday, I’ll have a guest blogger or two to keep you entertained. And hopefully, I’ll have lots to talk about upon my return.